To celebrate Father's Day, I volunteered to make a couple of desserts for a casual evening gathering on my parents' backporch. I decided to go with quick-n-easy desserts that I don't have the recipes for. A quick text to a co-worker got me started on the first - a strawberry angel food cake trifle. Basically, it's a layer of cut-up angel food cake (or pound cake), topped with a layer of pudding (made with 1 & 1/4 c. water or milk & a tub of whipped topping), then a layer of whipped topping (I heart whipped topping! ), then a layer of strawberries (or your choice of berries or fruit or candy). Repeat! Since my four boisterous nephews were also going to be present, I decided to go with cupcakes for my second dessert. One of the first recipes I remember baking on my own is black-bottom cupcakes - from scratch. The recipe was out of this great kid's cookbook that my sister and I loved. Well, I didn't have that recipe at home but I did have a box of chocolate cake mix, a brick of cream cheese and some chocolate chips! With a quick call to my sister who provided an alternate cream cheese mixture recipe, I was off to the oven. Beat cream cheese filling ingredients (except for choc. chips) together. Stir in chocolate chips. They turned out pretty good. Not quite a good as the originals, but no one complained! Next time I think I'll try to make the cake mix and filling a bit thicker and see what happens. 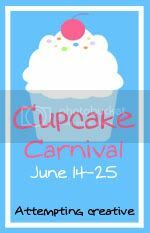 Be sure to visit some of the great posts from the Cupcake Carnival and Cupcake Tuesday by clicking on the buttons below. They are way more creative than I am! 2. My sense of humor: I’m a little off kilter and silly, just like my dad. We have some great inside jokes in my family and most of them can be traced back to my dad. I say “Butler.” He says “Cincinnati.” We both laugh. See I told you, an inside joke! First let me say that my dad reads two newspapers front-to-back every day and I picked up that habit from him as well. However, my mom does that as well but she does NOT read the funnies (what we call the comics page) – that is something I learned solely from my dad. It’s so bad that a) we’ve passed it on to my oldest nephew and b) dad and I can have such serious conversations about certain comic strips. So much so that if my mom walks in mid-conversation, she asks us who we are talking about. When we say “Crankshaft” or Funky Winkerbean,” she rolls her eyes and walks away! My dad’s work uniform is a white t-shirt, blue jeans and work boots. For his entire life, including the four years he went to college, he has farmed. He’s farming the same land that his father and grandfather farmed and that is a lesson as well. My dad instilled in me the knowledge that if you work the land and tend it carefully that it will provide for you – and your children and your children’s children and so on. It’s not an easy life’s work and I’m appreciative that he – and others – chooses to do it so I can pursue my life’s work without worrying about having to grow food to feed myself. One of the reasons I bought my condo almost two years ago was that I wanted some outdoor space again. I spent the previous 6-plus years in a second-floor apartment with no balcony. After growing up on a farm in the country with multiple yards (our side yard was the perfect shape for a ball diamond - though the long ball got lost in the corn more than once), I missed being able to sit outside and read. BUT I don't have the time (or really the desire) to keep up a big yard - or even a small one. So a condo with a small patio area is perfect for me. I have my outdoor space but not a lot of upkeep! Still, there is some yardwork that is necessary and since last year I didn't get around to planting anything until late July, I'm determined to spruce it up before my gal pals come over for a well-deserved girls weekend later this month. Before getting started, I went to my parents for inspiration. My folks have put a lot of time and effort into landscaping the homestead - especially the last few years since my mom retired from a 30-plus teaching career. You know teachers...they need to nurture. My mom has switched from surly teenagers to plants! This was where our above ground pool once was! My dad built my mom these window boxes and I love, love, love them! The chicken house once stood here. When I was growing up only the foundation was left, We spent many a summer day playing house, school, store there. This rock is now a part of the chicken house landscape feature. It broke my heart when my parents moved it from its spot under the tree in the side yard. It's a perfect standing rock - flat on the top, not too tall. Again it was a favorite childhood play spot. So, I now had my inspiration...and thanks to my dad I had my tools. I was tackling a rosebush so the leather gloves and long-handled clippers were a necessity. My first order of business was cutting back a rosebush that got out of control over the last two years because I don't know when or how to probably prune! As I started my journey to fit back into my super cute black swim shorts by July 4th, I decided to start with a vigorous walk after work on Tuesday. Unfortunately, a storm blew through that evening so I did some crunches instead. Luckily the weather has cooperated since then with two gorgeous summer evenings - perfect for walking. To prepare for my walk Wednesday evening, I pulled up my iTunes to create a playlist for my iPod that would inspire me to pick up my pace and get my heart a pumping! Unfortunately, I realized that my recent listening habits tend toward a more laidback type of listening! I pulled my "Exercise" playlist of 27 songs that I tried out during my walk last night. Most of them were OK. A couple really made me pick up my pace - like "Ruby" and "Paralyzed." And a few just didn't make the grade! I didn't have a lot of time to search iTunes today but I did grab a Katy Perry song (Hot N Cold) that I usually groove to in the car. I'm hoping to use a couple iTunes cards I got on one of my wheel & dealing trips to CVS to pick up a few more songs. An iPod is good, but company is better when it comes to exercising! Lil' Sister came over and walked with me tonight. It's great to have an exercise buddy AND time to catch up on each other's lives. I know I won't always have a real-live exercise companion, so I'm looking to you for help. Have any go-to songs when it comes to exercising? Send them my way. I only have 17 days to trim down...wow, really didn't do the math until just now. Maybe I'll just stick with the bigger pair of swim shorts! Cookie, anyone? See the swimming shorts above? Aren't they cute? I LOVE them. They are long enough to hide my not so firm upper thighs, but not too long to make me feel like I'm wearing a granny swimsuit. I have the black pair above and a similar pair in brown. The night before we headed down to Florida for our family vacation, I tried on my cute swimming shorts. The brown ones fit just fine (they are a larger size)...the black ones, not so much. Close your eyes and think "muffin top" - quick open your eyes...horrible image, huh? Sorry but now you know how I felt! This is a major problem. I have a lot of cute swim tops to go with my black swim shorts. I'm determined to get back into them by the July 4th holiday! Over the last 3-4 years, I've been floating between two clothing sizes and it's annoying. One size is just a little too snug. The next size up is just a little too big. Now, I'm not saying that I need to lose a bunch of weight - just about 5 pounds (maybe 10 to be back to my drivers license weight) so that I'm firmly in the smaller size. I do NOT want to go out and buy a bunch of new clothes...just fit into the clothes I already have! So, I've decided to start exercising regularly because I've tried the serious dieting route before and I just don't have it in me! I am planning to start eating more fruits and veggies and less chocolate and chocolate, but the main goal is to do some sort of exercise DAILY. I'm going to utilize the great walking path that is right outside my door and walk for at least 45 minutes 4 days a week. The other 3 days I'm going to do some sort of toning exercises - concentrate on losing some pounds around my middle. Any ideas for a good workout? I'm looking for some exercises/routines that work. I have been rocking the CVS and Walgreens deals (see this week's bounty above) for a while now, thanks to some tips from the Frugalista and a couple great sites that lay the deals out clearly each week (In Good Cents and Hunt 4 Freebies) - I'll get back to those shortly. This week I decided to try my luck at Meijer and their "10 for $10, 11th for free" deal. Add coupons, including double coupons up to 50 cents, and there are some deals to be had! I bought 38 items (including 22 from the "10" deal), used 17 coupons (6 were doubled) and spent...drumroll please...$34.10. This is a bit on the high side because I picked up some "impulse" items like balsamic vinegar (to make the Balsamic Rosemary Chicken Marinade over at GOODEness Gracious). I don't have a Meijer in my hometown, but I'll definitely make the trip again if the right items are on sale AND I have coupons! In addition to my shopping, I picked up some items for my mom as well this week (explains the over abundance of toilet paper purchased). The gals at the make-up counter at my local Walgreens are GREAT. They always make sure I have all the coupons I need to get the best deals possible. However, I came prepared this week. But, I got: $10 Register Rewards back! And, I got: $5 Register Rewards back! So, in the second transaction, I spent a grand total of $2.84 and took home $5 Register Rewards to use next week. I spent a grand total of $2.66 this week at CVS with $9 of Extra Care Bucks (ECB) used. And I got back $9 in ECBs! Somehow I got $8 back for the body wash even though there was a 1 item limit - score. I also used my Green Tag Bag ($1 ECB every 4th use). Be sure to scan your ExtraCare card at the "deal" machine at the CVS store before you checkout. Last week it gave me a $5 off $15 purchase that can be used on your total BEFORE coupons and ECB - just be sure to give it to the cashier before any other coupons. So there are my deals for the week. If you have any others, please share! I've been back at work for a week and haven't really had the time to think about those busy, yet fun days of our oh-so recent family vacation to Disney World. I'm hanging my head in shame. I only meant to eat half of it. The other half was to be an after-work snack for tomorrow. But I drank a glass of skim milk with it, so that makes it OK, right? Well, I didn't have to buy my nephews silly hats...their parents did it for me!